From Aztec messengers to the current-day “Running People,” pinole is an ancient food with timeless nutrition. First consumed by the Aztecs (and even shared with starving Spanish explorers), pinole is also known for its connection to the Tarahumara. 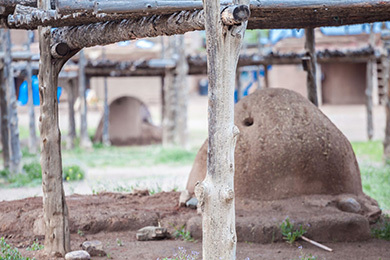 The people of this indigenous tribe, located in northern Mexico, are renowned for the ability to run hundreds of miles between villages, fueled only by pinole and chia seed. Although chia has soared in popularity, pinole has remained largely unknown. So, what is this ancient superfood, and how was it made? Pinole is a power food, most often consumed as a hot cereal or thick beverage, whose cornerstone ingredient is a special variety of wild purple maize. An ancestor to today’s corn, this GMO-free strain of maize contains twice the antioxidants of blueberries, which give both plants their vibrant purple color. This maize, once cultivated by the Inca and Maya peoples, was planted and harvested by hand. The rich soil and radiant sunshine of the Andean foothills nurtured and protected this grain, keeping it safe from extinction and genetic modification. Its legacy continues on today. After harvest, this maize would first be roasted with cacao in a wood-fired adobe oven, giving the mixture a nutty flavor and lightly smoked aroma. In its journey towards pinole, the resulting blend would be ground by hand using a heavy stone mortar and pestle, a laborious process eventually yielding a smooth yet hearty meal. Finally, pinole would be prepared with fresh milk, spices, and a touch of agave, creating a breakfast that was as delicious as it was filling. No artificial sweeteners, preservatives, or stabilizers were needed—the quality and heritage of the ingredients was enough. The ancients understood well the nutritional power of pinole, and today’s technology only confirms their knowledge. Purely Pinole today takes the power of the ancient recipe and boosts it even further with a nudge of premium vegetable protein from peas. Did you know there are 23 grams of protein in every prepared bowl of Purely Pinole? Add that to 40 grams of whole grains and powerful antioxidants and you’ve got a breakfast like no other! Truly a a staple for better health. Pinole has powered thousands of days of adventure and discovery, and we are honored to be sharing its legacy with you.